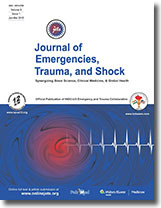 Background: Rapid Ultrasound in Shock (RUSH) is a recently reported emergency ultrasound protocol designed to help clinicians better recognize distinctive shock etiologies in a short time. We tried to evaluate the accuracy of early RUSH protocol performed by emergency physicians to predict the shock type in critically ill patients. Materials and Methods: Our prospective study was approved by the ethics committee of trauma research center, Baqiyatallah University of Medical Science, Iran. We enrolled 52 patients with shock state in the emergency department from April 2013 to October 2013. We performed early bed-side sonographic examination for participants based on RUSH protocol. Patients received all needed standard therapeutic and diagnostic interventions without delay and were followed to document their final diagnosis. Agreement (Kappa index) of initial impression provided by RUSH with final diagnosis, and also sensitivity, specificity, positive predictive value (PPV), and negative predictive value (NPV) of RUSH for diagnosis of each shock type were calculated. Results: Fifty-two patients were enrolled in our study. Kappa index was 0.7 (P value = 0.000), reflecting acceptable general agreement between initial impression and final diagnosis. For hypovolemic and obstructive shocks, the protocol had sensitivity of 100% but had lower PPV. For shocks with distributive or mixed etiology, RUSH showed PPV of 100% but had low sensitivity. For cardiogenic shocks, all reliability indices were above 90%. Conclusion: We highlight the role of RUSH examination in the hands of an emergency physician in making a rapid diagnosis of shock etiology, especially in ruling out obstructive, cardiogenic, and hypovolemic types. Context: Long-term sedation with midazolam or propofol has been demonstrated to have serious adverse side effects, such as toxic accumulation or propofol infusion syndrome. Ketamine remains a viable alternative for continuous sedation as it is inexpensive and widely available, however, there are few analyses regarding its safety in this clinical setting. 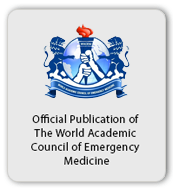 Objective: To review the data related to safety and efficacy of ketamine as a potential sedative agent in mechanically ventilated patients admitted to the intensive care unit (ICU). Materials and Methods: This was a single-center retrospective study from September 2011 to March 2012 of patients who required sedation for greater than 24 hours, in whom ketamine was selected as the primary sedative agent. All patients greater than 18 years of age, regardless of admitting diagnosis, were eligible for inclusion. Patients that received ketamine for continuous infusion but died prior to receiving it for 24 hours were not included. Results: Thirty patients received ketamine for continuous sedation. In four patients, ketamine was switched to another sedative agent due to possible adverse side effects. Of these, two patients had tachydysrhythmias, both with new onset atrial fibrillation and two patients had agitation believed to be caused by ketamine. The adverse event rate in our patient population was 13% (4/30). Conclusions: Among ICU patients receiving prolonged mechanical ventilation, the use of ketamine appeared to have a frequency of adverse events similar to more common sedative agents, like propofol and benzodiazepines. Context: Renal trauma is increasingly being managed conservatively. Grade I-III injuries are managed conservatively whereas Grade V injuries may end in surgery. Managing Grade IV renal trauma is individualized and managed accordingly. Aims: To evaluate retrospectively all Grade IV renal injuries managed in our institute over five years and to review the available literature. 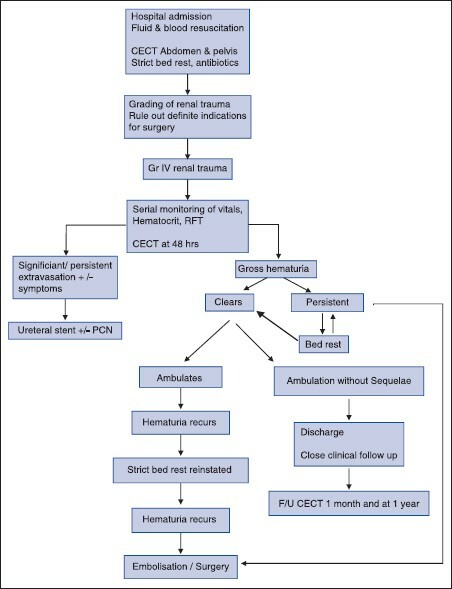 Settings and Design: Reviewing the records of patients who sustained renal trauma and study all Grade IV renal injuries. Materials and Methods: We retrospectively analyzed all Grade IV renal injuries (16) managed at our institute between July 2008-August 2013. All patients were treated conservatively initially by hemodynamic stabilization, strict bed rest, if required endoscopic procedures. These patients were followed up with CECT. Statistical analysis: Descriptive statistics was performed using Microsoft excel spreadsheet 2007. Continuous data were described as mean and range. 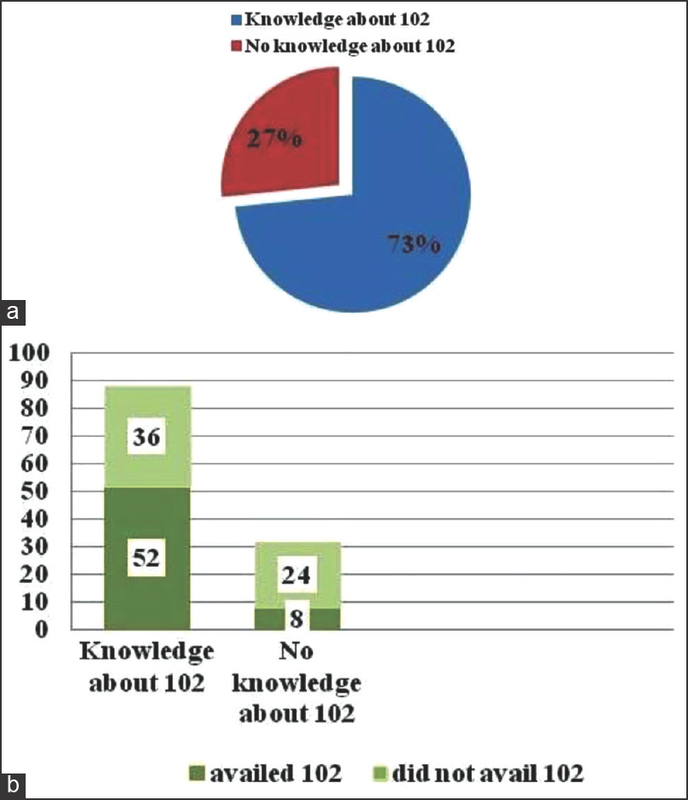 Categorical data was described as percentages. Results: Sixteen patients with Grade IV renal injury were included in the study. All patients had gross hematuria and 15 had urinary extravasation. D-J Stenting was done in 7 patients; perinephric tube drainage with D-J stentingwas done in 2 patients. One required selective upper pole arterial embolisation. 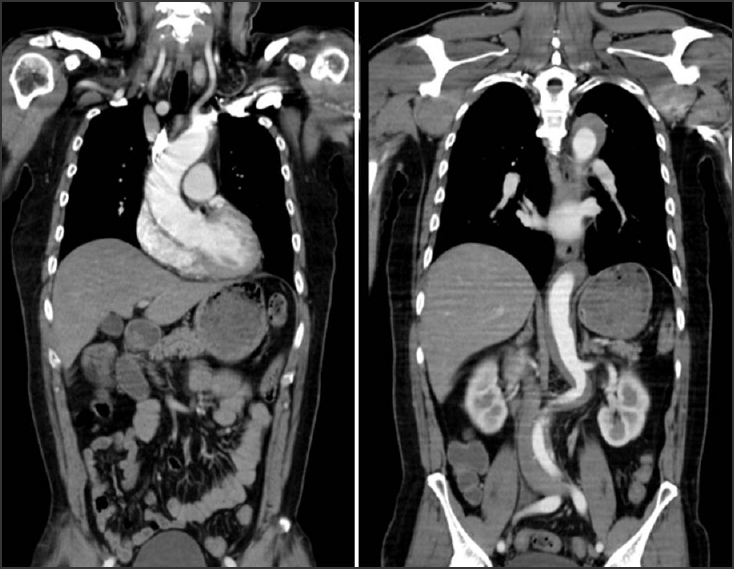 Nephrectomy was not required in any of the patients. In the follow-up period, no patient had delayed complications. Conclusions: Successful conservative management of Grade IV renal trauma requires constant monitoring both clinically and radiologically, and if properly managed, kidneys can be salvaged in all stable patients as reinforced by our study. Background: Thoracic trauma occurred in 10% of the patients seen at US military treatment facilities in Iraq and Afghanistan and 52% of those patients were transfused. Among those transfused, 281 patients received warm fresh whole blood. A previous report documented improved survival with warm fresh whole blood in patients injured in combat without stratification by injury pattern. A later report described an increase in acute lung injuries after its administration. 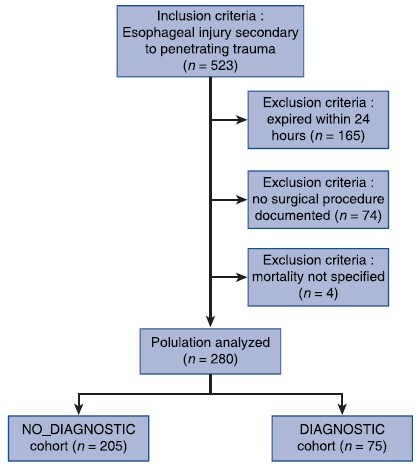 Survivorship and warm fresh whole blood have never been analyzed in a subpopulation at highest risk for lung injuries, such as patients with thoracic trauma. There may be a heterogeneous relationship between whole blood and survival based on likelihood of a concomitant pulmonary injury. In this report, the relationship between warm fresh whole blood and survivorship was analyzed among patients at highest risk for concomitant pulmonary injuries. Materials and Methods: Patients with thoracic trauma who received a transfusion were identified in the Joint Theater Trauma Registry. Gross mortality rates were compared between whole blood recipients and patients transfused with component therapy only. The association between each blood component and mortality was determined in a regression model. The overall mortality risk was compared between warm fresh whole blood recipients and non-recipients. Results: Patients transfused with warm fresh whole blood in addition to component therapy had a higher mortality rate than patients transfused only separated blood components (21.3% vs. 12.8%, P < 0.001). When controlling for covariates, transfusion of warm fresh whole blood in addition to component therapy was not associated with increased mortality risk compared with the transfusion of component therapy only (OR 1.247 [95% CI 0.760-2.048], P = 0.382). Conclusion: Patients with combat related thoracic trauma transfused with warm fresh whole blood were not at increased risk for mortality compared to those who received component therapy alone when controlling for covariates. Context: There have been few reports investigating the effects of air transportation on patients with decompression illness (DCI). Aims: To investigate the influence of air transportation on patients with DCI transported via physician-staffed emergency helicopters (HEMS: Emergency medical system of physician-staffed emergency helicopters). Settings and Design: A retrospective medical chart review in a single hospital. Materials and Methods: A medical chart review was retrospectively performed in all patients with DCI transported via HEMS between July 2009 and June 2013. The exclusion criteria included cardiopulmonary arrest on surfacing. Statistical analysis used: The paired Student's t-test. Results: A total of 28 patients were treated as subjects. Male and middle-aged subjects were predominant. The number of patients who suddenly surfaced was 15/28. All patients underwent oxygen therapy during flight, and all but one patient received the administration of lactate Ringer fluid. The subjective symptoms of eight of 28 subjects improved after the flight. 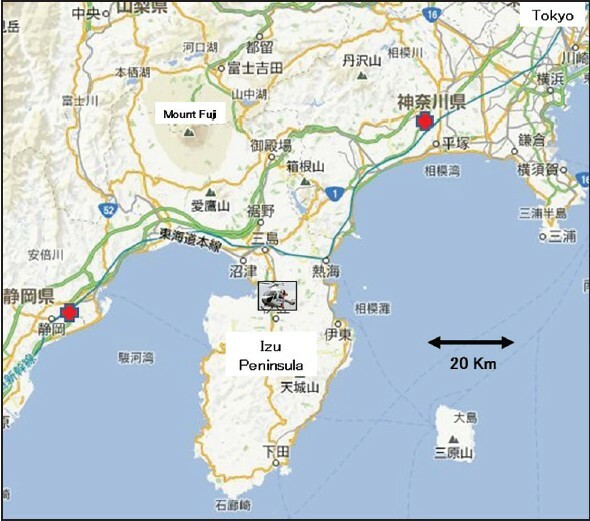 The range of all flights under 300 m above sea level. There were no significant differences between the values obtained before and after the flight for Glasgow coma scale, blood pressure, and heart rate. Concerning the SpO 2 , statistically significant improvements were noted after the flight (96.2 ± 0.9% versus 97.3 ± 0.7%). There were no relationships between an improvement in subjective symptoms and the SpO 2 . Conclusion: Improvements in the subjective symptoms and/or SpO 2 of patients with DCI may be observed when the patient is transported via HEMS under flights less than 300 m in height with the administration of oxygen and fluids. Background: Excessive crystalloid administration is common and associated with negative outcomes in critically ill trauma patients. Continuous furosemide infusion (CFI) to remove excessive fluid has not been previously described in this population. 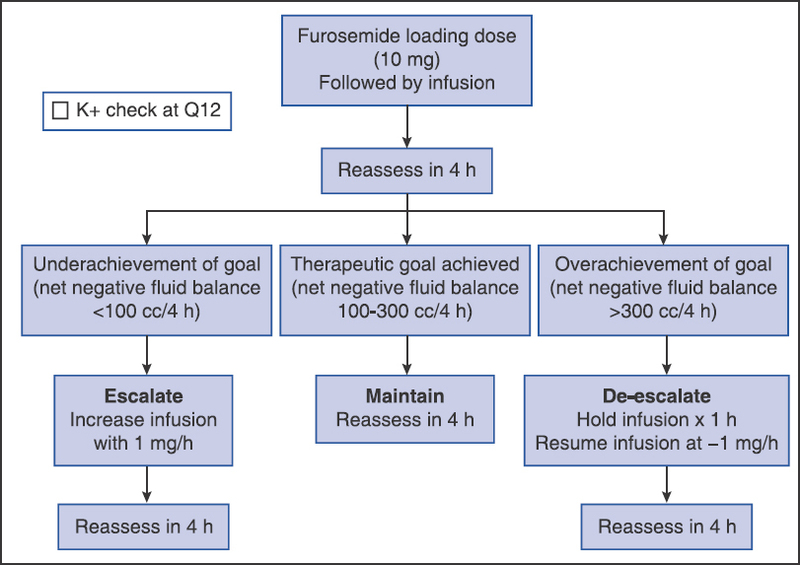 We hypothesized that a goal-directed CFI is more effective for fluid removal than intermittent bolus injection (IBI) diuresis without excess incidence of hypokalemia or renal failure. Materials and Methods: CFI cases were prospectively enrolled between November 2011 and August 2012, and matched to historic IBI controls by age, gender, Injury Severity Score (ISS), and net fluid balance (NFB) at diuresis initiation. Paired and unpaired analyses were performed to compare groups. The primary endpoints were net fluid balance, potassium and creatinine levels. Secondary endpoints included intensive care unit (ICU) and hospital length of stay (LOS), ventilator-free days (VFD), and mortality. Results: 55 patients were included, with 19 cases and 36 matched controls. Mean age was 54 years, mean ISS was 32.7, and mean initial NFB was +7.7 L. After one day of diuresis with CFI vs. IBI, net 24 h fluid balance was negative (−0.55 L vs. +0.43 L, P = 0.026) only for the CFI group, and there was no difference in potassium and creatinine levels. Cumulative furosemide dose (59.4mg vs. 25.4mg, P < 0.001) and urine output (4.2 L vs. 2.8 L, P < 0.001) were also significantly increased with CFI vs. IBI. There were no statistically significant differences in ICU LOS, hospital LOS, VFD, or mortality. Conclusions: Compared to IBI, goal-directed diuresis by CFI is more successful in achieving net negative fluid balance in patients with fluid overload with no detrimental side effects on renal function or patient outcome. Context: There have been no reports that have studied the characteristics specific to bodyboard injuries. Aims: To clarify characteristics to bodyboard injuries. Settings and Design: A retrospective medical chart review. Materials and Methods: A medical chart review was retrospectively performed for all patients with spinal cord injuries transported via physician-staffed emergency helicopters between January 2009 and October 2013. The subjects were divided into two groups based on whether they had a spinal cord injury induced by bodyboarding (Bodyboard group, n = 14) or not (Control group, n = 14). Statistical Analysis Used: Using a χ2 -test, Mann-Whitney U-test and non-paired Student's t-test. Results: All but one of the subjects had spinal canal stenosis. The age of the patients in the Bodyboard group was younger than that of the Control group. The ratio of males and Glasgow Coma Scale of the Bodyboard group were higher than those on the Control group. The spinal cord injury induced by bodyboarding typically occurred after impacts of the head or face with the sea bottom while the subject was being buffeted by the waves. The severity of the spinal cord injury in the Bodyboard group was lower than that in the Control group. Conclusion: Bodyboarding tended to induce spinal cord injuries after the head or face collided with the sea bottom, and was more common in middle-aged males during the summer season, and was associated with a favorable outcome. 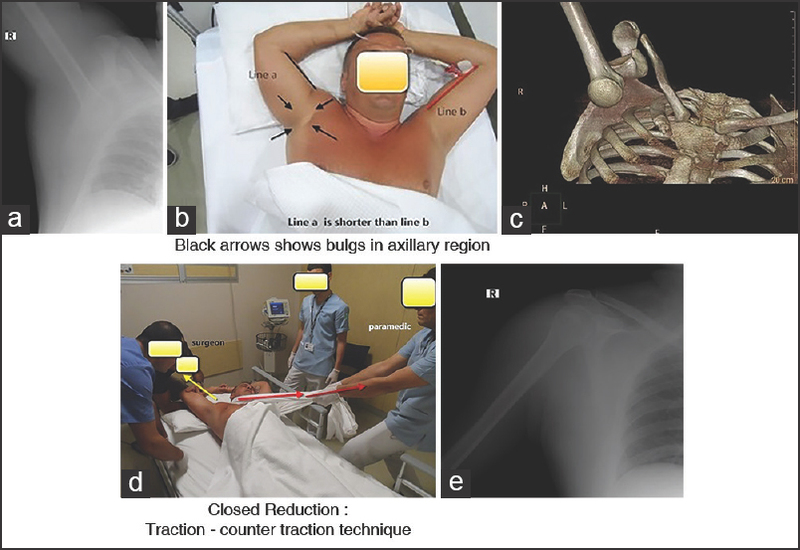 Inferior shoulder dislocation also referred to as luxatio erecta is an unusual and rare type of shoulder dislocation. Its incidence is about 0.5% among all shoulder dislocations. After an exhaustive search of all the available literature we were unable to find a swimming accident case that did not have other associated injuries and an uneventful reduction. The mechanism of the injury was mostly related to direct axial loading and indirect hyperabduction lever arm. We would like to emphasize the importance of this being a swimming accident, a type of accident that requires awareness of the possibility of dangerous asphyxia injuries caused by panic in the water (swimming pool, river, lake, sea, etc.). We described the nature of the injury and review the literature concerning the mechanism of the injury and associated neurovascular impairment at admission time. We also presented a supplemental video to contribute to the education of young residents and orthopedic surgeons. A 19-year-old male suffered orthopedic fractures, blunt solid organ injury and pneumopericardium after a fall from 40 feet. With the exception of an external fixation device, he was managed non-operatively and discharged to a rehabilitation unit after 8 days. He was readmitted 4 days later with chest pain and clinical evidence of pericardititis that resolved with the initiation of non-steroidal anti-inflammatory drugs and colchicine. He returned to the rehabilitation hospital, but was readmitted once again for chest pain and hypotension. Echocardiogram revealed cardiac tamponade that required emergent drainage. He tolerated the procedure well and was discharged home from the hospital to continue treatment for his pericarditis. He is doing well at 3 months of follow-up. Marchiafava-Bignami disease (MBD) is a rare pathological condition affecting the corpus callosum (CC), characterized by progressive demyelination and necrosis. While usually found in patients with chronic alcoholism, it has rarely been characterized in non-alcoholics. 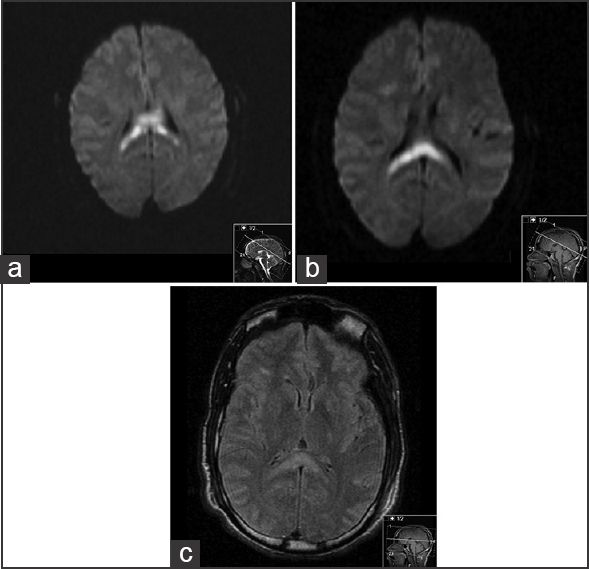 We describe a trauma patient with an unknown mechanism of injury, who was found to have MBD after remaining comatose for a prolonged period of time. Magnetic resonance imaging (MRI) demonstrated restricted diffusion involving the genu, body, and splenium of the CC. The patient eventually awoke but was non-communicative and uncomprehending prior to discharge to a nursing facility. We reviewed the literature and report here the first case of MBD encountered in a trauma patient. In conclusion, MBD is an extremely rare condition in non-alcoholic patients, and the use of MRI is crucial for its identification. Intraosseous access is an alternative route of pharmacotherapy during cardiopulmonary resuscitation. Extracorporeal membrane oxygenation (ECMO) provides cardiac and respiratory support when conventional therapies fail. 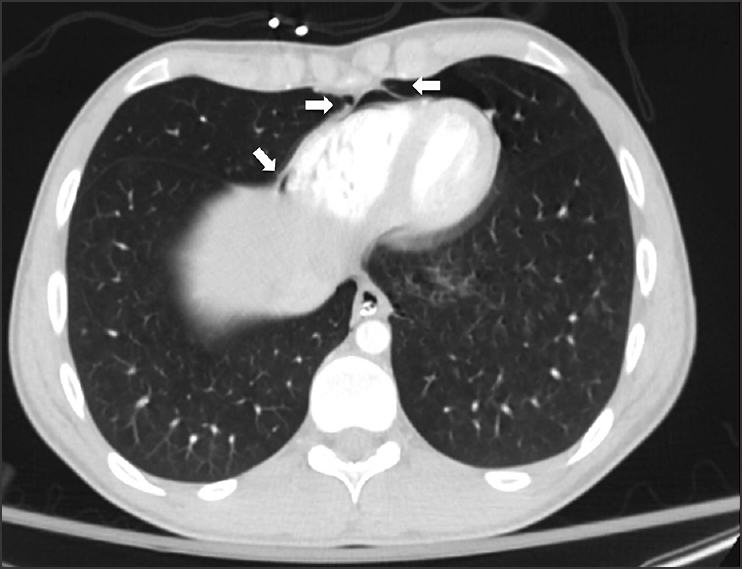 This case reports the use of intraosseous thrombolysis and ECMO in a patient with acute massive pulmonary embolism (PE). 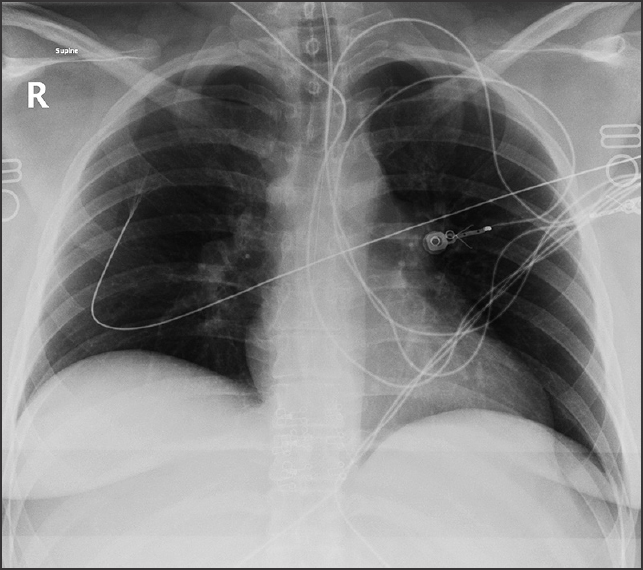 A 34-year-old female presented to the emergency department with sudden onset severe shortness of breath. Due to difficulty establishing intravenous access, an intraosseous needle was inserted into the left tibia. Echocardiography identified severe right ventricular dilatation with global systolic impairment and failure, indicative of PE. Due to the patient's hemodynamic compromise a recombinant tissue plasminogen activator (Alteplase) bolus was administered through the intraosseous route. After transfer to the intensive care unit, venous-arterial ECMO was initiated as further therapy. The patient recovered and was discharged 36 days after admission. This is the first report of combination intraosseous thrombolysis and ECMO as salvage therapy for massive PE. Flumazenil, a benzodiazepine receptor antagonist, is the drug of choice for the diagnosis and treatment of benzodiazepine overdose. We are presenting a patient with chronic alcoholism and alcoholic liver disease, who came with alcohol withdrawal symptoms and treated chlordiazepoxide. Subsequently he developed a prolonged change in mental status that required treatment for benzodiazepine overdose and hepatic encephalopathy with flumazenil infusion for 28 days. Unstable ankle fractures and impacted tibial pilon fractures often benefit from provisional external fixation as a temporizing measure prior to definitive fixation. Benefits of external fixation include improved articular alignment, decreased articular impaction, and soft tissue rest. 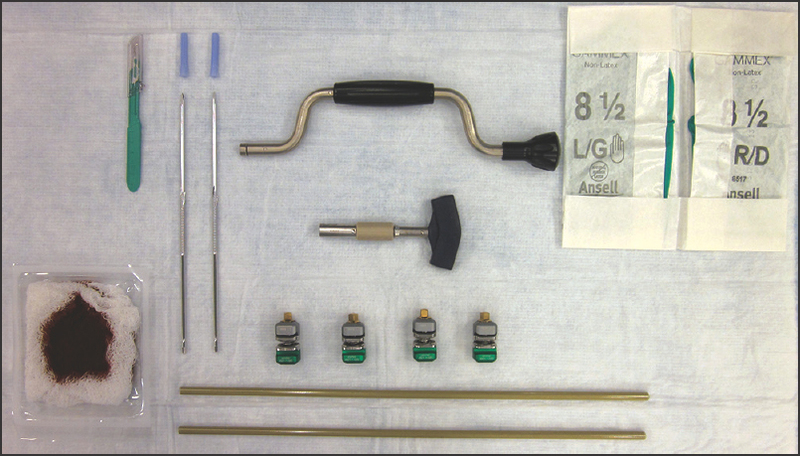 Uniplanar external fixator placement in the Emergency Department (ED ex-fix) is a reliable and safe technique for achieving ankle reduction and stability while awaiting definitive fixation. This procedure involves placing transverse proximal tibial and calcaneal traction pins and connecting the pins with two external fixator rods. This technique is particularly useful in austere environments or when the operating room is not immediately available. Additionally, this bedside intervention prevents the patient from requiring general anesthesia and may be a cost-effective strategy for decreasing valuable operating time. The ED ex-fix is an especially valuable procedure in busy trauma centers and during mass casualty events, in which resources may be limited. Even with its broad spectrum and low cost, concern over chloramphenicol's adverse effects limited its use in the United States during the 1980s. 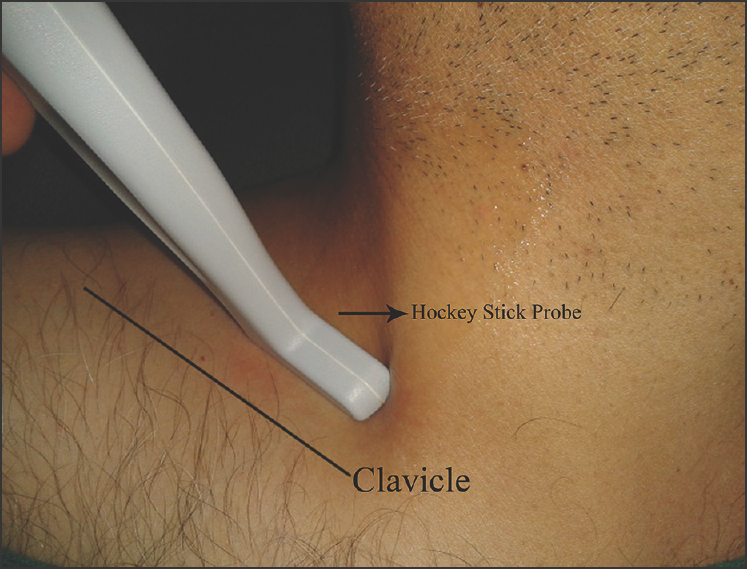 Reports from United Kingdom and China in the 1990s demonstrated a low incidence of blood dyscrasias with the topical preparation of chloramphenicol, and showed continued good efficacy and low cost. Today, topical chloramphenicol is being used by some groups within otolaryngology and ophthalmology in the United States. As a result, emergency physicians are once again considering chloramphenicol-induced side effects in patients presenting to the emergency department. To date, there have been no published reports associating chest pain, dyspnea with chloramphenicol use, and there has only been one report of fungal esophagitis associated with topical chloramphenicol. We present a 31-year-old woman, 4 months status post tympanoplasty with a modified radical canal wall down mastoidectomy due to a cholesteatoma involving the epitympanum who had a residual tympanic membrane defect. 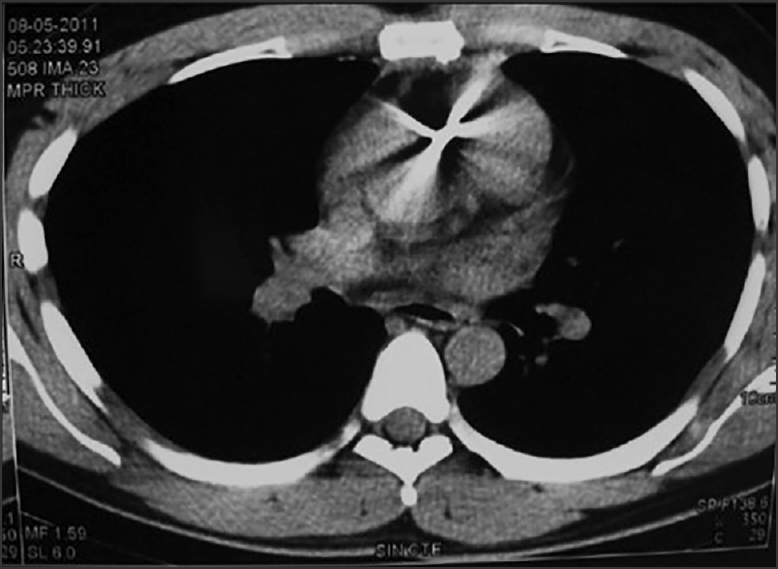 She presented to the emergency department with chest "burning", with no other symptoms shortly after starting treatment with an insufflated combination antibiotic containing chloramphenicol. After ruling out cardiopulmonary or vascular etiology, she was treated successfully with a gastrointestinal cocktail cocktail for presumed esophagitis secondary to newly prescribed chloramphenicol.